We live today in a Babylon of confusion. Hundreds of denominations, each teaching a different creed. 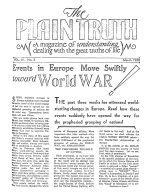 The PLAIN TRUTH comes as a magazine of UNDERSTANDING to help those who honestly hunger and thirst after righteousness out of this modern confusion, into the knowledge of TRUTH. Solomon was wise when he asked for UNDERSTANDING! But he would have been wiser, had he asked for something else! There is one thing that is even more important — a thing that is still more rare. That thing is LOVE! It does make a difference what we believe. It is the TRUTH that shall make us free. But, "though I have the gift of prophecy, and understand all mysteries, and ALL KNOWLEDGE... and have not CHARITY, I am nothing!" Can you have LOVE, in patience and kindness, toward the one with whom you disagree? If you can't, you'll never repel error or find TRUTH. Why do people argue, strive, quarrel, over differences of belief? That is not the way into truth. Rather it confirms one in his error, until he comes to BELIEVE a lie. "Hereby know we the spirit of TRUTH, and the spirit of error. Beloved, let us LOVE one another..." (I John 4:6-7). Stop and think a moment. The one great barrier that separates professing Christians into denominational bundles — that keeps them apart — that promotes rivalry, hatred, and causes continued new splits and divisions — is this insane insistence that the other fellow must see "eye to eye" on every little point of doctrine! The one chord that binds together each little denominational bundle is the identical thing that has caused every split and division that ever took place between brethren — DOCTRINE! As long as DOCTRINE is employed as the basis for church unity, every so called "church" will continue to suffer strife, division and separation into more divisions. And yet each denomination firmly believes that it, and it alone, is God's one and only TRUE CHURCH! And they think they base their claim on solid Bible evidence, the same as YOU probably think about YOURS! So many assume that salvation hinges upon such an organization connection and whether you accept its creed! But Jesus said differently. "By THIS shall all men know ye are my disciples, IF YE HAVE LOVE one to another!" Why can't we have it? Lacking that LOVE for those who see some points a little differently, we lack also the SPIRIT which alone can guide us into the TRUTH. The inspired Word says we must "GROW in grace and in KNOWLEDGE," (II Peter 3:18). We fear there is still so much we all have yet to learn, that each can afford to have charity for those who see some things differently. God's Word must tell the truth when it says we now "see through a glass, darkly; but then face to face: now I know IN PART," etc. And again, we shall all "see eye to eye WHEN the Lord shall bring again Zion" — or, as the marginal rendering says: "when the Lord returneth to Zion," (Isaiah 52:8). Then the earth shall be FULL of the knowledge of the Lord (Isaiah 11:9). We do not mean to imply that whatever a man believes is right, or that it makes no difference so long as we have love. Freedom must come thru the TRUTH, but — catch this! — the TRUTH can come only thru LOVE! Love is the first fruit of the Spirit who guides us into Truth. When love is lacking, the Spirit has fled. LOVE comes FIRST! Beyond doubt you will read things in the PLAIN TRUTH which conflict with what you have believed. If The PLAIN TRUTH cannot bring you something you did not know before, or correct you where you were wrong, it will have failed in its mission. Its real value to YOU lies in how much correction and added knowledge it brings. And so, we ask, do as the Bereans were commended for doing with Paul. Read, study, without prejudice. Then search the Scriptures whether these things are so! (Acts 17:10-11). Then write us if you still disagree, and let us study it together in LOVE. Why can't those who profess to be God's children have kindness, gentleness, and LOVE toward each other. Let us open our hearts to God's LOVE, and then we can have PEACE with our minds opened for God's TRUTH."